nice, hows .44 special compared to other rounds? I love the .44 Spl. 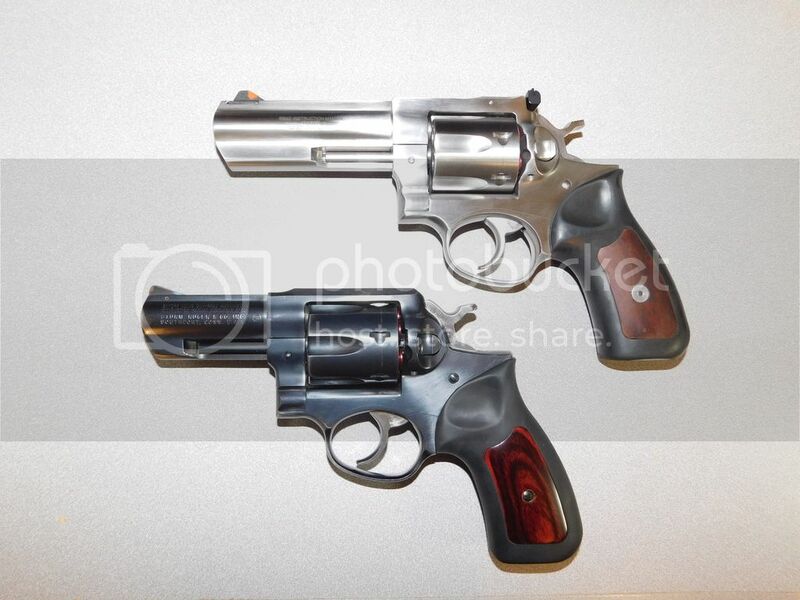 I think it and the .41 Magnum are what all revolvers should be chambered in. Well them and .38-44 High Velocity. Ruger makes a good six gun. Now that's a nice spinner, son! For some reason I'm particularly intrigued by 3" barrels.. not sure why, but just about all of them look real good. Likin' the chambering, too - Forgot they got those in .44 Sp. I overlooked the Special for years as the price difference was only a few dollars less than the Magnums. until 3 or 4 years ago when I bought a S&W Model 24 and it took Specials. I compare it to a 45 ACP or a 45 Colt at a sub-magnum level. Took me twenty years to try it, but when I did, I finally got it. 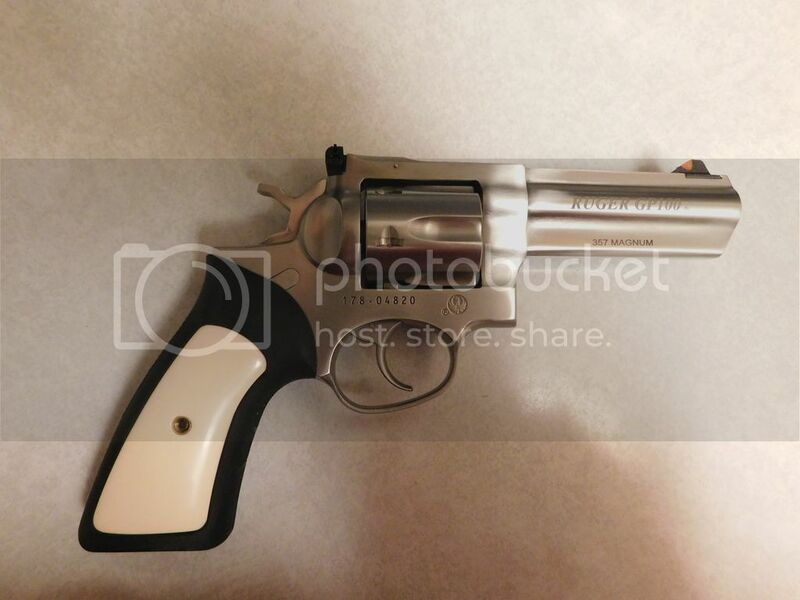 I'm supposed to have the 8-shot Ruger Redhawk in 357 Magnum soonish. I had heard they were bringing that caliber, but I thought it had been out for a wee bit already. Guess I was wrong, either way though! But it just looks great. 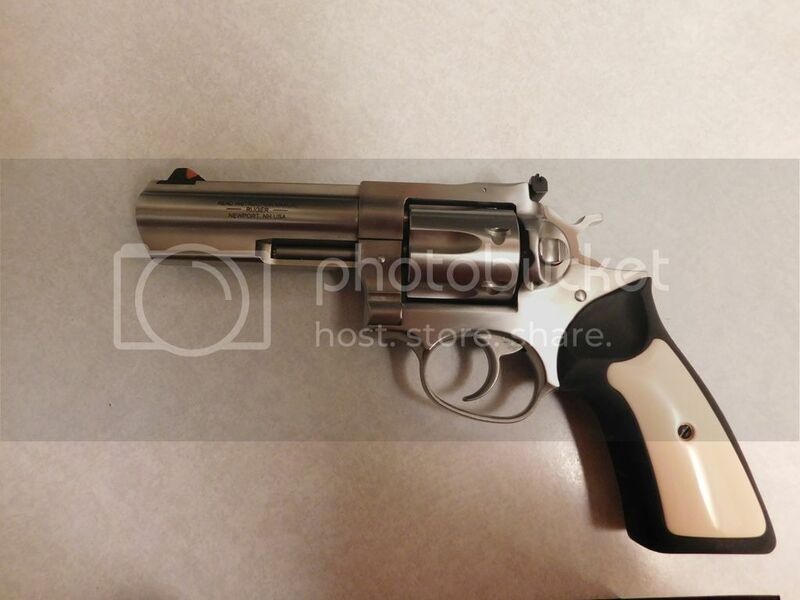 I remember the S&W Model 696 they had for a minute a few years back, and thought it looked good, even with the full underlug. I agree 3" does have a good balance and feel on most revolvers, though I think 4" works pretty well too overall. Agree about the Bulldog, would be a good piece to put up somewhere, like that. I like the special both itself but also as a Smith man - In all honesty I'd probably shoot it more in the wheelguns. Though I'd probably also have some Magnums, though those would be more for shoulder pieces - Lever-action carbines and such. Replaced the factory installed front sight with a high-viz front sight that I ordered directly from Ruger. Replaced the Houge grips with Altamont grips. The grip panels are made of "bonded ivory" which I ordered as well. Altamont is one of a few companies that makes the original rubber grips that Ruger used to put on the GP100. The older style grips fit my hands better and I just like the look of them. Last edited by Jcordell; 09-09-2017 at 10:25 PM. That's ironic, I was trying to replace my original wood and rubber grips on my GP100 with a Hogue grip, but I can't since I have an early model. I got lighter springs on mine to lighten the DA trigger pull. I'll have to look into the high viz front sight. My eyes are getting older along with the rest of me and I find that the red front site is just easier to see plus I'm more of a traditionalist. 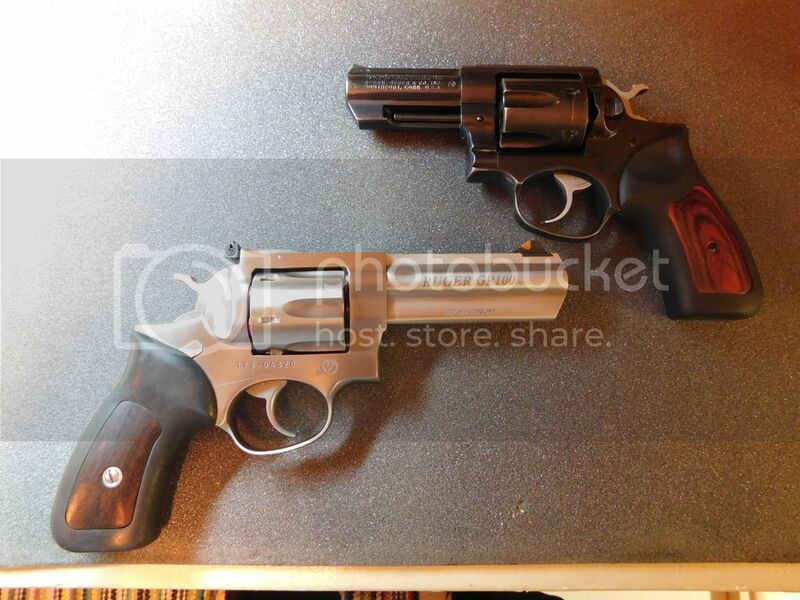 Well I was worried that my sole Ruger GP100 was getting lonely so when I found this 3" GP100 I had to take it home for company. Incidentally I don't have large hands and the smaller grips that used to be standard on the 3" movel fits the full-size model as well. Fits my smallish hands very nicely. Reminds me of the Pachmayr Compac grip. Last edited by Jcordell; 10-09-2017 at 09:24 PM.